Almost exactly 12 and a half years ago, I saw my first ever baseball game at RFK Stadium, as the Washington Nationals, then a brand-new commodity, defeated the Chicago Cubs 5-4. It had been roughly 10 years since my last baseball game here when I stepped through the main gate for last Sunday’s match, the last-place DC United taking on the dominant New York Red Bulls in United’s final match, and the final game of any kind, at the historic stadium. Reminders of the stadium’s past were everywhere. Outside, large monuments stood in honor of the stadium’s original tenants. One was for George Preston Marshall, founder of the Redskins, who called RFK home for 35 years from 1961 to 1996, and won all five of their NFC Championships there. The other stood for Clark Griffith, owner and manager of the original Washington Nationals/Senators, Baseball Hall-of-Famer, and namesake of DC legend Griffith Stadium. This monument, in fact, originally stood at Griffith, and was moved when the old stadium was demolished in 1964. Accompanying these monuments were two printed Redskins helmets on concrete, now faded, along with a bust of Robert F. Kennedy himself. My seat was in section 311, close to the main gate. From it, I could see the pitch, much of the upper deck, soccer hooligans supporting both teams, and the old baseball dugouts, unused for 10 years. With about 20 minutes left in the game, I decided to take a walk and take some pics. The concourses were small, cramped, and dark. Ramps were everywhere, and cables for various purposes ran over my head. It wasn’t difficult to see why United was so eager to leave; the stadium is in an advanced state of decay. Many of the upper-deck seats, exposed to the elements, suffer from peeling paint. The metal framework of the stadium is coated with rust, and the football pressbox, unused since the Redskins moved out, sits abandoned. The section numbers had been haphazardly spraypainted on at some point, reflecting the ramshackle nature of the decaying concrete monster. Beautiful patterns had began to carve themselves in the rust. And the game wasn’t without its events; as I walked around the upper deck, the DC Ultras fan group, seated directly below where I was, set off smoke bombs with the team colors. Shortly beforehand, the Viking Army, the Red Bulls’ traveling support group, had fired a flare into the open area below their seats, and set off another one in the center of their group. These empty concourses and concession stands, once serving thousands of fans, were all set to close for the last time. The orange seats where I sat were used for likely the final time since they were installed. The sense of “this is the end” permeated the whole stadium. As expected, the game didn’t end well. New York won 2-1, and the team’s 21-year tenure in RFK ended with a whimper. The fans filed out one last time as United held a ceremony of team legends saying goodbye to what has become known as, “America’s Temple of Soccer.” Highlight videos of the team’s time there were played, and it was capped off by a firework show to bring a close to the 21 years United had spent as the stadium’s primary tenant. I walked out past the old turnstiles, never to be used again. After taking one final picture of the stadium at night, I finally walked to my car and drove home. The paid attendance for the night was 41, 418; the largest crowd at the stadium since David Beckham debuted for the Los Angeles Galaxy in a road game at the stadium. After 56 years of service as a host of baseball, football, and soccer, the stadium, in its advanced stage of decay, has outlived its useful life. 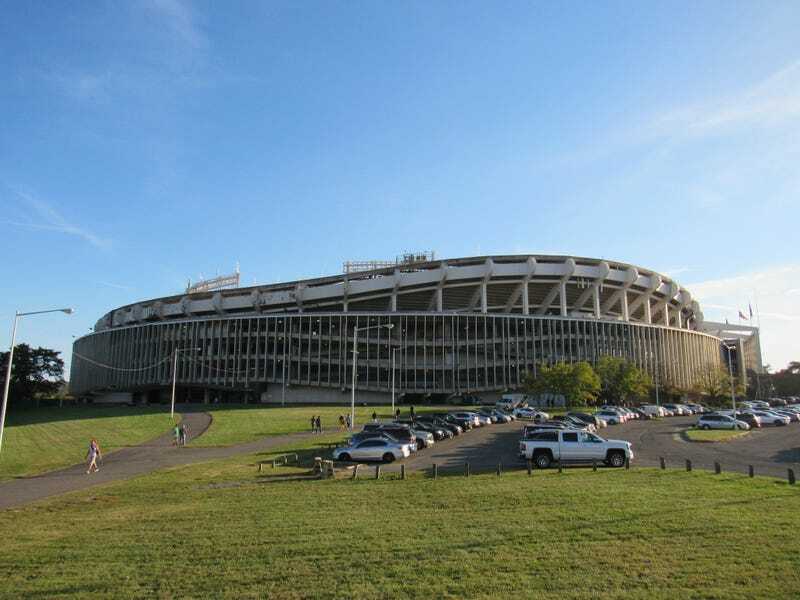 It’ll likely be demolished at somepoint in the next 20 years (knowing the DC city council), and replaced with some sort of park or a new Redskins stadium. But no matter what goes in, it’ll never have the unique charm of RFK. It may be a crumbling, rusty old concrete donut, but it’s our crumbling, rusty old concrete donut, and it’ll certainly be missed.